That old adage that, "the camera never lies" is now something of a farce. Anyone with a half decent PC and an image editor, can alter a digital image to tell just about any story they like. In the same way, some of the gizmos used primarily in the world of video, are now becoming accepted parts of the professional photographers toolkit. The green screen is a case in point - a familiar concept to anyone who has watched a sci-fi film in the past five years. It can transport the actors into just about any location you could dream up, without them having to leave the safety and convenience of the studio. The technical term for this is chroma keying. A postproduction technique for compositing two images, or video streams based on their color hues, and FXhome's PhotoKey is designed to bring this facility to photographers regardless of their expertise or budget. This version designated 6, is said to simplify the process without losing the quality the product has become noted for. The review is based on the Pro version, yet there's also a standard version, aimed more at the home or semi-pro photographer. It's a cheaper product, and the differences between the two can be compared on FXhome's website. PhotoKey is a standalone program, but will also install as a plug-in filter for Adobe Photoshop (if it's found on your system). Used this way it provides seamless integration between the products, and consequently better productivity. 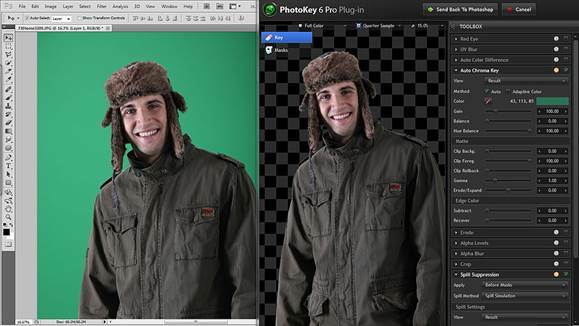 When it comes to using PhotoKey, it's almost disappointing because it does its ‘thing1 pretty much automatically. You can still apply a tweak here and there but quite honestly in most cases it knows best. I tested it on a variety of different subjects, trying to trip it up but I must say the results are very impressive. You know the old paint around the edge with red, then fill in the bits you want to keep in green method that some programs use? Well forget about all that, because PhotoKey works it out automatically. One of the major problems affecting this type of product, is the ability to handle hair, lace, or any other fine detail. To combat this the designers have added a new adaptive color feature that improves the result quite dramatically. It does this by re-filtering the image, to restore some of the fine detail lost in the removal of the green background... again the results are very impressive. Another useful feature added to this version is batch processing. 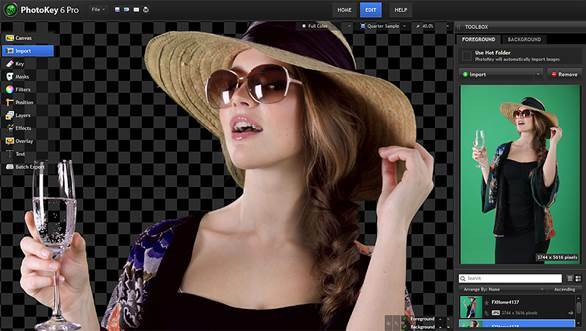 It will automate the integration of different background and foreground elements for a series of images. Very useful for those clients who want a variety of backgrounds to choose from or simply when you want to find a background that fits a particular subject. We're not done yet, though, because PhotoKey Pro 6 also includes a wide range of effects and filters, these range from white balance, contrast and saturation to more subtle options like color temperature, bilateral blur and silhouette. These are not gimmicks either, they provide useful functions that are time consuming to achieve manually. Take for example the leave color filter. This allows you to specify a color to keep, before removing the color from the rest of the image. A well-used feature in advertising when you want to highlight an object, or particular section of an image. Again very quick and easy to use with refinement controls for the tolerance, edge softness and blend. Finally the program ships with 25 professional background images, so you'll have a small library to get you started. Although most any high resolution images can be used.